Palestrina: Magnificat primi toni a 8; Byrd: Laudibus in sanctis; Bach: Prelude in c minor BWV 546 (Organ solo); Lotti: Cruxifixus a 8; Humfrey: Hear, o heavens; Purcell: Jehovah, quam multi sunt. 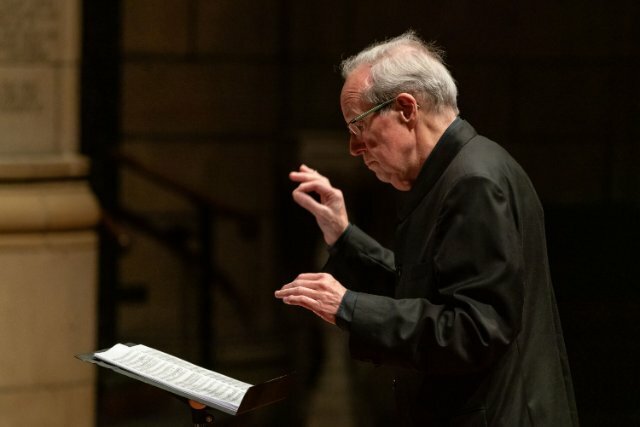 Stephen Cleobury has been the Director of Music for the internationally-renowned Choir of King’s College, Cambridge for longer than both men who preceded him. 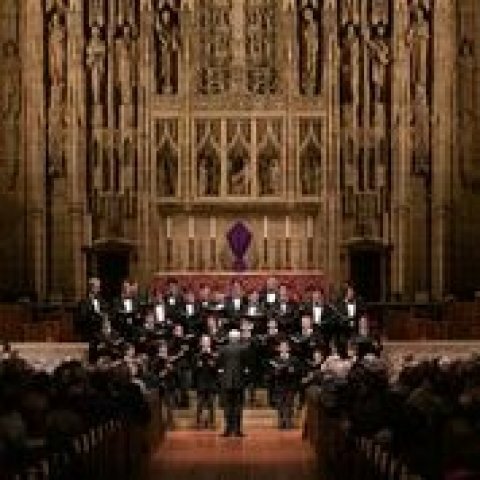 To celebrate the conclusion of his tenure, he performed his last United States concert at Saint Thomas Church in New York. He has maintained a close relationship to the Church and its own famous choir for his entire career. 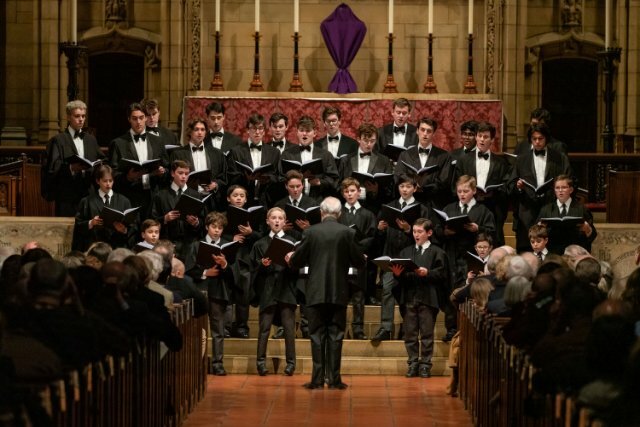 The program bracketed the history of church music from Claudio Monteverdi (1567-1643) to contemporary Norwegian composer Ola Gjeilo’s Ubi Caritas. Cleobury noted that he had met Gjeilo that afternoon, but most of the other composers were not available. Monteverdi began the program. The choir sang his setting of parts of Psalms 96 and 98 to show not only his position at the pinnacle of Renaissance Church music, but hints that music should reflect the meaning of the text, a novel idea at the time. Tallis followed, sung with his famous consistency and ease of performance. 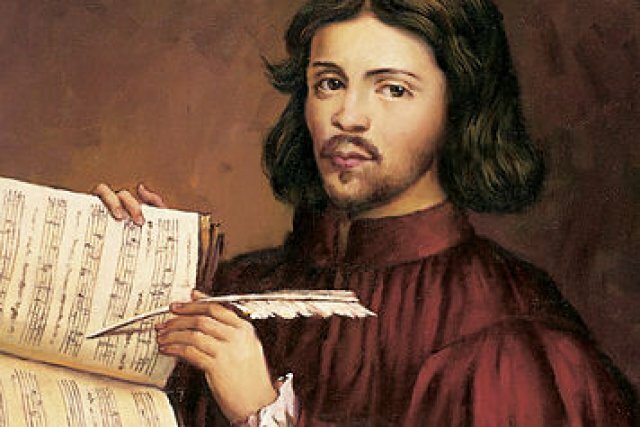 Tallis’ student William Byrd, whose setting of the 150th Psalm was performed to reveal word-painting, dance rhythms and construction in sections, which characterized this composer. Each work was carried by the special delivery of the musicians. Giovanni Pierluigi da Palestrina of course is known for his dynamism, his melodic lines and the dissonances first suggested by Monteverdi. Rumors that he saved church music from its ban by the Council of Trent (1545-1563) which wanted to forbid polyphony are not founded, but they have provided an intriguing base for the opera abased on Palestrina’s life, aptly titled Palestrina by the German composer Hans Pfitzner, first performed in 1917. Leaping forward, Benjamin Britten’s setting of Praised Be the God of Love, a poem by George Herbert, features two choirs and angels. The main choir sang energetic phrases at a quicker tempo and also a quiet response to a slower solo line. They build to a fury with the organ crashing hand chords and the pedal flying. There were two organ pieces in the program, by J.S. Bach and Louis Vierne, whose perfumed phrases contrasted pleasingly with the Bach. In the beginning, composers needed the church for support of the work and a place to perform. Today you sense that the church needs music to draw people in and hopefully entrance them with beautiful sounds in a peaceful setting. 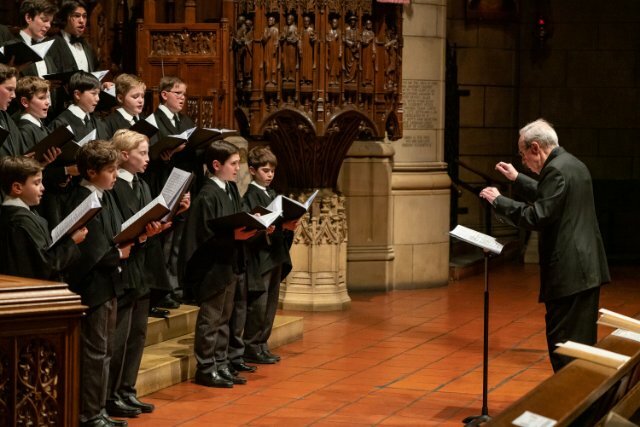 Surely listening to the boy sopranos of King’s Choir, in unison and solo, you understand why Orlando de Lassus (1532-1594), a famous composer who dominated the 16th century with Palestrina, was kidnapped three times because he had such a beautiful soprano voice as a boy. 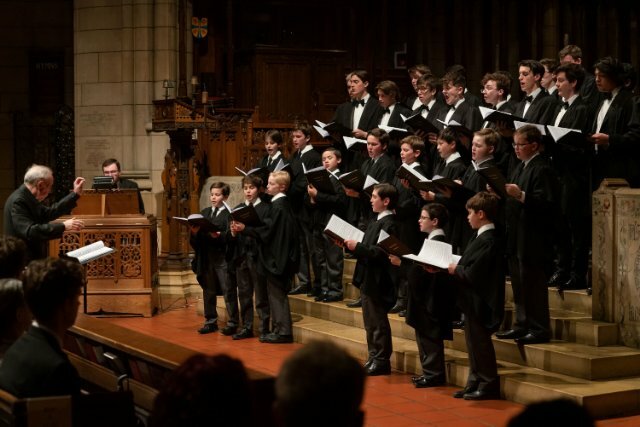 This lovely concert at Saint Thomas certainly made the listener yearn to come back for more. Leading up to Easter, during Holy Week, performances featuring the Miller-Scott Organ will vividly depict the pivotal events from the Passion of Christ. On Monday, April 15 at 6:45 PM, organist Benjamin Sheen will perform Marcel Dupré’s Symphonie-Passion, and on Tuesday, April 16 at 6:45 PM, Daniel Hyde will perform a mixed program of organ music for Lent.